1. We need volunteers at the event, to distribute groceries, food and drinks. Volunteers, please confirm your attendance via email to yeapkimsee@hotmail or via SMS to Kim at 012-3036019. 2. We are planning to go for seafood lunch, at a nearby restaurant, somewhere in Kapar, after the Deepavali event. Volunteers who would like to attend the lunch, please confirm via email to yeapkimsee@hotmail or via SMS to Kim at 012-3036019. Please note that lunch will be at your own expense. 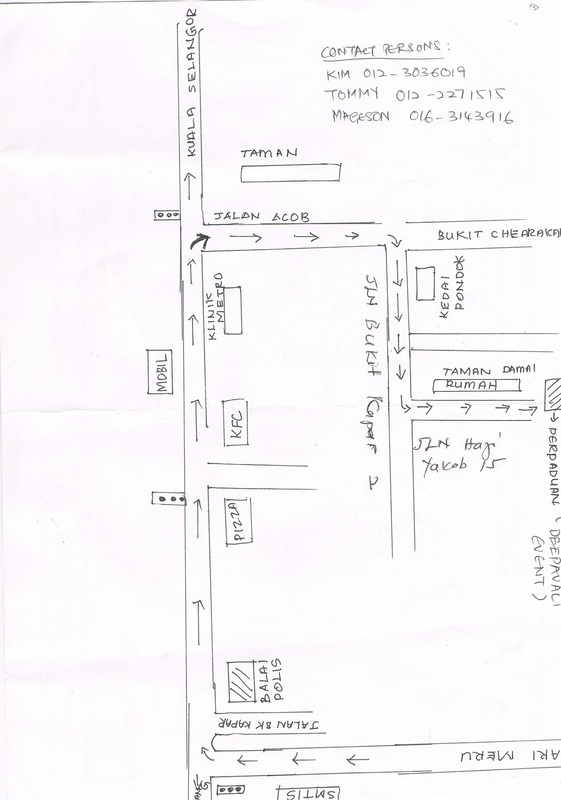 - Attached is the map to the event venue. - Please note that time to gather at Ti-Ratana Penchala on the event day has been changed to 10:00am. Please scroll down to program for more details. - We have also updated the Wish List with donors' name. There are still some items on the Wish List which have yet to be taken up, including sarongs, lunch, children's tee-shirts. 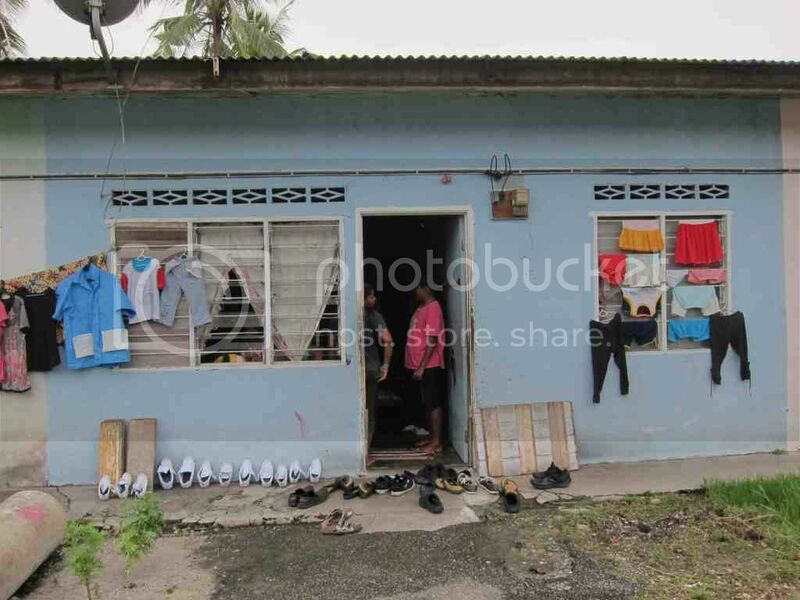 Puan Kamatchi lives in this dilapidated house in Kg Tap with her husband, 11 children and her sister-in-law. The children are between 5 to 18 years old. The older 3 children are from her husband’s first wife, who left him for another man and abandoned the children. The eldest daughter, who is 18 years old, works away from home. She gives money when she comes home occasionally. Kamatchi’s husband works as a security guard and makes about RM750 a month. Kamatchi is asthmatic and has a bone disease. Her husband’s sister who is hypertensive, asthmatic and diabetic, also lives with them. Despite the difficult circumstances at home, Kamatchi will always ensure her children attend school, and without an empty stomach. Puan Suseela, a 35- year old mother of six, used to work from home “fixing” screws at RM1.50 for 1,000 pieces. She could complete 6000 screws/day, which gave her an average of RM200-RM300 per month. 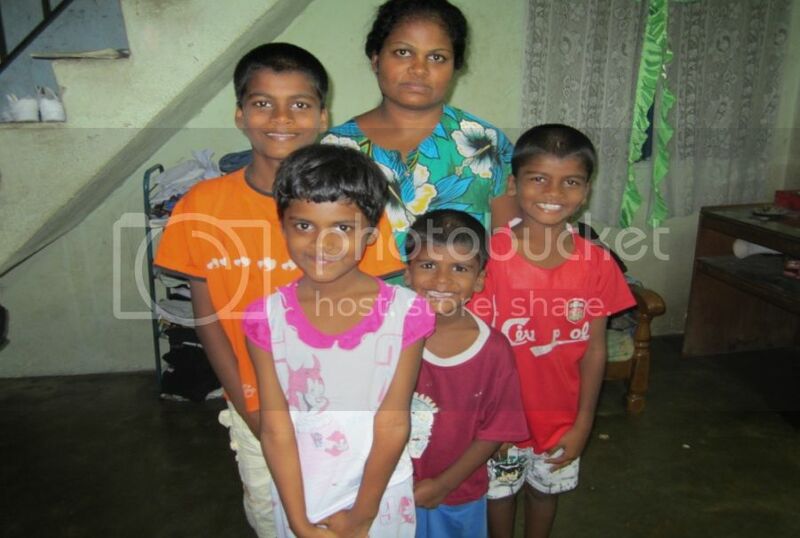 In 2011, Suseela got a job as a cleaner in a kindergarten that pays her RM400 per month. Her employer bought her a motorbike to commute to and from home, for which, she is paying RM150 each month. To ease the financial burden, she also cleans a private home twice a month for RM50 per month. Her husband has been mentally ill since an accident several years ago and works on and off (he gets aggressive without medications and is unable to hold a job for long). Her 67-year old mother-in-law works as a cleaner and earns RM300 per month. She has five school-going children. Her 7-year old, Drivani, is mentally slow and have problems with her speech. She goes to Klang Utama Pendidikan Khas daily. Fortunately, they live in her mother-in-law’s house and do not have to pay rent. 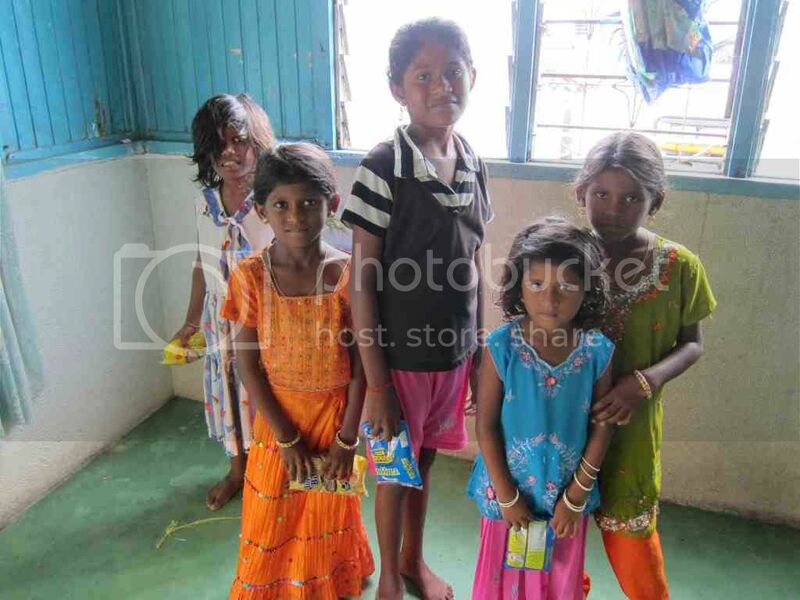 However, life is still tough for Suseela; she struggles in giving her children enough food to eat and good education. When asked if she would be willing to put one or two of her children in a children’s home, she vehemently said “No way!” Despite the hardship, she loves her children too much to send them away. Puan Sundari, 30 years old, is a single mother who works as a house cleaner and earns RM450 a month. Her husband abandoned her and the children and has since remarried. She has five children, aged 11, 9, 8, 6 and 5 years. The children stay at home alone after school, during school holidays and on Saturdays when the mother is at work. Rental for the house is RM250 a month, and the balance of RM200 is barely enough to feed the young and growing children. If you are touched by the plight of these mothers and their children, then please join us on Sunday, 11 November 2012, to celebrate the Festival of Light with these families and 42 other families in similar situation. We would also like to say a BIG THANK YOU to all the participants of Bro Billy Tan's workshop held in Ti-Ratana NBC Klang recently for their generous donations to our Meals On Wheels Projects. For all items except lunch, you may sponsor the actual items in whatever quantities or donate cash (any amount) by banking into our account. We would like to serve the same food for lunch to all 200 pax, thus it will be more efficient to source from a single caterer. However, we welcome sponsorship for lunch in terms of cash (any amount). Contents of the children’s goodie bags must be the same for all 150 bags, and may contain biscuits, candies, small toys, etc, the cost of which should be about RM2. All items must be delivered to Ti-Ratana Penchala Centre latest by 5pm on Wednesday, 31st October 2012, to allow the committee sufficient time to buy any outstanding items and pack the items. Kindly email us at trccpenchala@gmail.com for more details. Please arrive at the Ti-Ratana Penchala Centre by 10.00am sharp for a briefing. 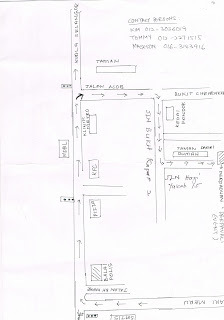 We shall convoy together to Dewan Taman Damai, Kapar thereafter. No transportation will be provided, so kindly ensure you make your own arrangements if you wish to carpool with other volunteers to get to the event venue and back to the Centre. Lets do whatever little we can to help make this Deepavali more festive and memorable for these less fortunate families.